Spiders a big fear for many people, though most of these creepy crawly critters shouldn't be feared--except for the brown recluse spider. This is one of the most venomous spiders in the United States and they love to find their way into people's yards and homes. Their bites cause severe pain and tissue damage, so if you start seeing them around your house, it's time to take measures to get rid of them. Clean up your home. Brown recluse spiders and other insects love to make their home or hide out in piles of junk that accumulate in the home. 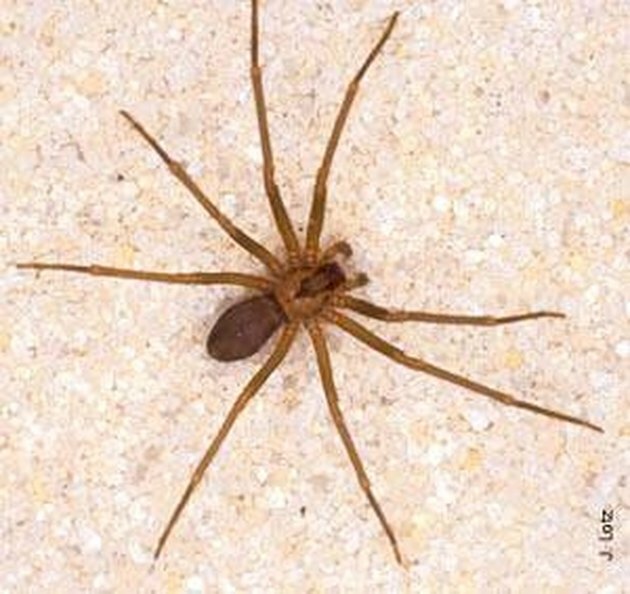 Give the brown recluse fewer places to hide by cleaning up piles of clothes, magazines and similar items and storing them in sealed containers. Go around your home and look for any holes or cracks in walls, doorways or windowsills. Use some indoor/outdoor caulk to seal up these cracks to prevent more brown recluse spiders from entering your home. Place some eucalyptus leaves or branches in your windowsills and plant some in your garden if you have the room. It is a great natural brown recluse repellent that can also be used for home medicinal purposes. Plus, these plants smell great. Spider traps can be placed in those dark corners that spiders love, but that you don't want to go check on regularly. These are pesticide-free and trap spiders who walk onto them, keeping them there until they die. Place some hedgeapples around the house as well. These are all-natural and non-toxic and are quickly becoming known as one of the best repellents for brown recluse and other spiders, . In the summer of 2003, Mark Orwell began his career as a freelance writer focusing on popular culture, music, and film. He continues to write on a broad array of topics from Miami, Florida. His work has been available in the United States, the Caribbean, and South Africa.